There’s not much growing around Chicago these days. That means farmers markets are on hold and even the most persistent locavores are forced to shop at conventional grocery stores. A young San Francisco company called GrubMarket hopes it can keep consumers connected to local food suppliers with an ecommerce platform that lets farmers and small food businesses sell their goods, even in mid-winter. The company expanded operations to Chicago in December in its first push beyond the west coast. “I am a big fan of local food and supporting local farms,” said founder and CEO Mike Xu. GrubMarket is a member of of the San Francisco accelerator Y Combinator’s current class. Xu said the company has raised $2 million from the program and other investors since launching in February. The platform includes 280 vendors who sell to the Chicago and San Francisco markets, Xu said. The majority of those are in the Bay Area. Chicago is GrubMarket’s first expansion market because of Xu’s connection to the Midwest — he went to the University of Wisconsin at Madison — and due to the number of farms and farmers markets here. The vendors GrubMarket works with may not be big enough or even willing to sell their goods through retail channels. Xu said his company can help those who want an easier way to sell directly to customers. He’s set on creating software to automate the inventory process, for example. Xu said GrubMarket has sold $400,000 worth of food, including fresh produce, cheeses, nuts, condiments, meats and more. GrubMarket contracts with drivers to offer free delivery of goods, though vendors have the option of charging customers for direct shipping. The site indicates when products will be available for delivery, so customers know if an item won’t be available until the following week, for example. Sharon Seleb, the company’s general manager for Chicago and the Midwest, said Chicago customers can buy goods from vendors in Illinois, Indiana, Wisconsin and Michigan. She said she works with vendors and helps them market their goods with free photography. Since GrubMarket takes a negotiated percentage of vendors’ gross revenue, Seleb said it’s in the company’s interest to promote their goods. Customers also have the option of ordering Grub Boxes, pre-selected cases of goods with themes such as fruits or meats to be delivered at regular intervals. The prices depend on size and contents. GrubMarket’s California Fruit Bounty box costs $45 for a regular box and $65 for the large version. The service thereby is unlikely to replace the grocery habits of most Chicagoans, said Darren Tristano, executive vice president at Chicago-based food and foodservice consulting firm Technomic. He expects Millennials or more affluent consumers — those who likely frequent farmers markets — to take interest in GrubMarket. 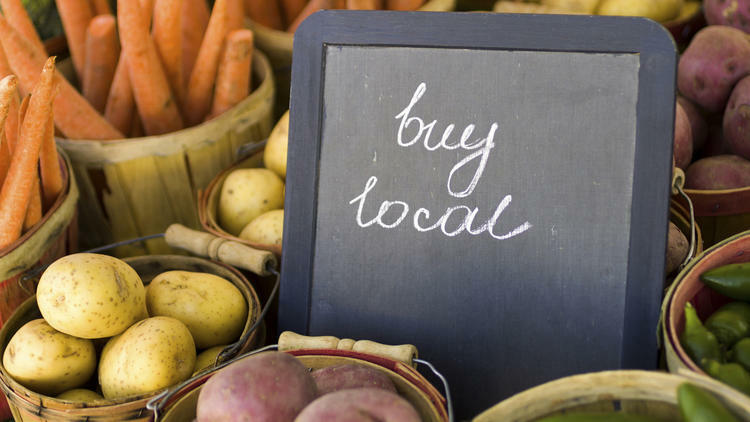 Tristano said the local food movement is driven by shoppers’ desire to make purchases they see as supportive of their communities or eco-friendly because products don’t need to be shipped as far. All of this has contributed to a change in these consumers’ values. Tristano also pointed to restaurants’ role in the success of farmers markets. In many places, he said, chefs seek out fresh goods from local markets. He suggested that some may turn to GrubMarket for similar reasons. This entry was posted on Wednesday, January 7th, 2015 at 2:57 pm and is filed under Farmers Market, Food, Future Plans/Announcements, Growth, Local Foods. You can follow any responses to this entry through the RSS 2.0 feed. You can leave a response, or trackback from your own site.